GAHS junior Ben Cox (23) attempts a shot during the first half of the Blue Devils 91-39 victory over River Valley on Tuesday night in Bidwell, Ohio. RVHS senior Layne Fitch (2) attempts a shot during the second half of the Raiders 91-39 setback to Gallia Academy on Tuesday night in Bidwell, Ohio. BIDWELL, Ohio — For now, the bragging rights belong to the Blue Devils. 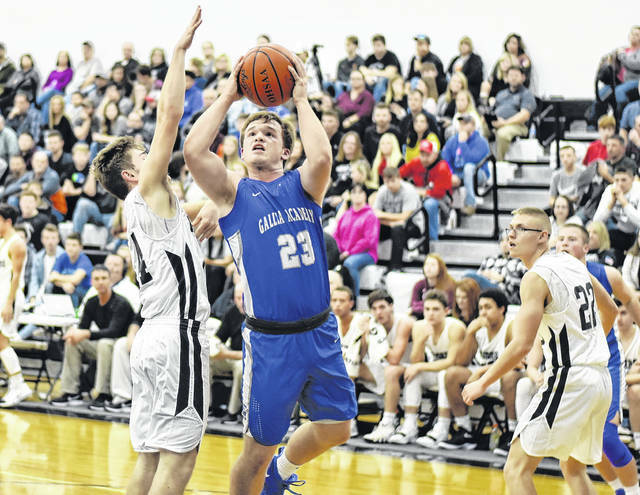 The Gallia Academy boys basketball team led Tuesday night’s non-conference contest against host River Valley, as the Blue Devils earned a decisive 91-39 victory in a battle of Gallia County rivals. GAHS (2-0) jumped to an early 10-3 lead with 4:58 remaining in the first quarter, before closing out the period on a 17-8 scoring run to take a 27-11 advantage into the second quarter. The Blue Devils furthered their lead in second quarter, as the utilized a 12-0 run to widen the margin to 39-11 with 2:05 remaining until halftime. River Valley (0-2), however, closed the half on a 7-4 scoring run to cut the deficit to 43-18 at the intermission. Gallia Academy outscored the hosts 30-11 in the third quarter to increase its lead to 73-29 entering the finale. GAHS utilized a 6-of-12 performance form the field, including 3-of-6 from beyond the arc, as River Valley made 4-of-7 attempts in the period, to close out the 52-point victory. Following the game, sixth-yeah GAHS head coach Gary Harrison was pleased with his team’s effort — particularly their play in transition. Gallia Academy finished with a 38-of-65 (58.4 percent) shooting performance from the field, including 8-of-17 (47 percent) from three-point range. In contrast, the River Valley shot 15-of-41 (36.5 percent) overall, including 3-of-11 (27.2 percent) from long distance. From the free throw line, GAHS was 7-of-11 (63.6 percent), while the hosts were 2-of-11 (18.1 percent). GAHS won the rebounding battle by a 32-18 margin. 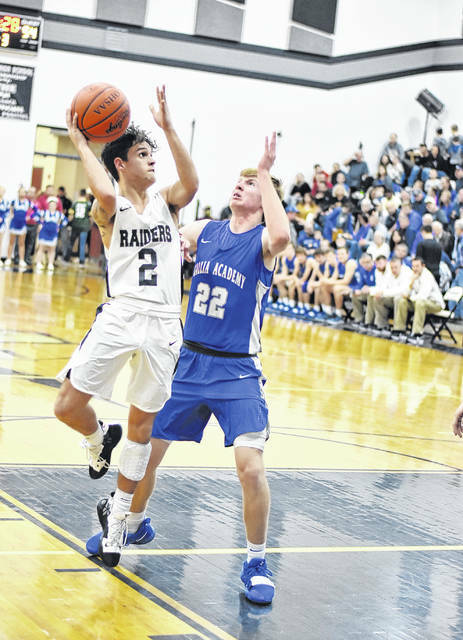 The Silver and Black committed 18 turnovers in the setback, while the Gallia Academy had three giveaways. Zach Loveday finished with 25 points to lead the Blue Devils in scoring, including two trifectas. Caleb Henry was next with 12 markers, while Cory Call, Justin McClelland and Logan Blouir each finished with 10 points apiece, respectively. Brenden Carter added eight markers, while Cole Davis chipped in four points, including a perfect 2-of-2 from the charity stripe. Justin Wilcoxon and Ben Cox each had three points, as Blaine Carter added two markers. Reece Thomas concluded the scoring totals for Gallia Academy with one point. Despite the setback, first-year RVHS head coach Brett Bostic saw many positives in this squads performance. Layne Fitch paced the Raiders with 16 points, as Myles Morrison followed with six markers. Rory Twyman was next with five points, while Jordan Lambert and Cole Young followed with four points and three markers apiece, respectively. Brandon Call and Chase Caldwell each provided two markers, as Matt Mollohan provided one point to close out the scoring totals for River Valley. The Raiders will look to avenge the setback, when the travel to face the Blue Devils on Feb. 2 in Centenary. Up next for River Valley, a home date with TVC Ohio foe Athens, while the Blue Devils host Ohio Valley Conference opponent Rock Hill on Tuesday.